Popcorn Floor Display Warmer (TO FIT ON), open, 2 shelves, L0.70м. 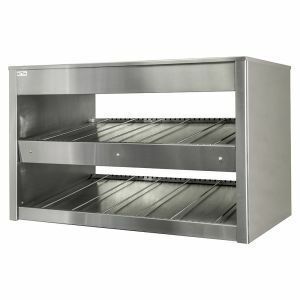 Tabletop open food display warmer with two warming shelves. Designed for demonstration and storage of pre-packed products. It is made of stainless steel. Components of the leading European manufacturers are used in the warmer’s design. By implementing and combining glass ceramics heaters and heating cable, a steady temperature field is achieved across the surface of the shelf. Temperature of each shelf can be controlled separately by a thermo regulator from 30C to 90C. The interval between shelves is 210mm. There is a lighting above every shelve. Shelves are equipped with crossbars enabling to divide shelves on parts of different width. Popcorn Floor Display Warmer (TO FIT ON), open, 2 shelves, L1.05м.